In January 2017, Intact Media Group’s TV division showed audience evolution on important time intervals, on all targets (commercial, urban and national) compared to the same period of last year. The entire Group, as well as each of the five TV stations scored market share appreciation. 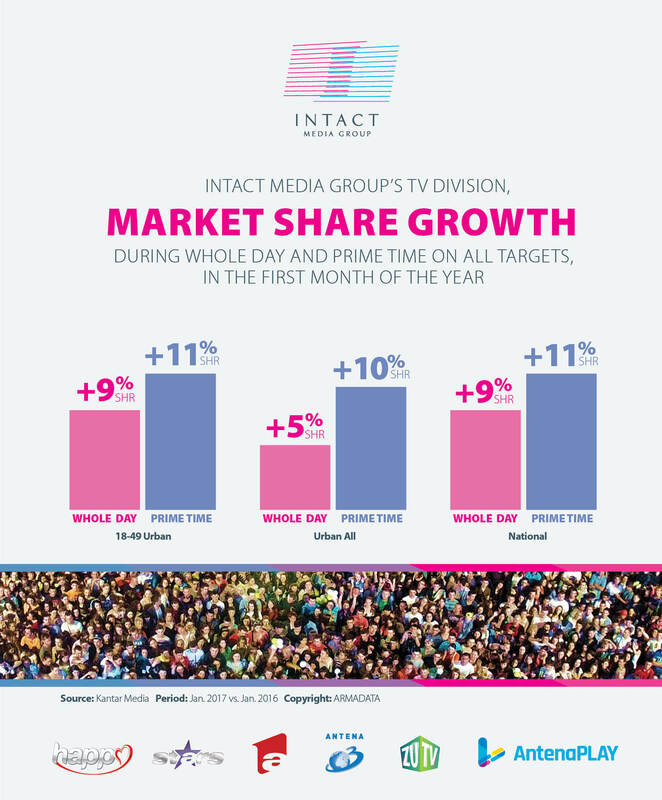 Intact Media Group’s TV stations led on key time slots, on the Urban and National targets, in terms of market share. Commercial target: Intact’s channels have market share appreciations on most time intervals, amongst which Prime Time (+11%) and Whole Day (+9%). Urban All: the TV division leads most time slots, amongst which Whole Day and Prime Time. Market share increased on the majority of time intervals, compared to January 2016. Național: Intact Media Group’s TV stations hold the first position during Day Time and Access, with market share appreciation on all time slots, including Whole Day ( +9%) and Prime Time (+11%), compared to January 2016. 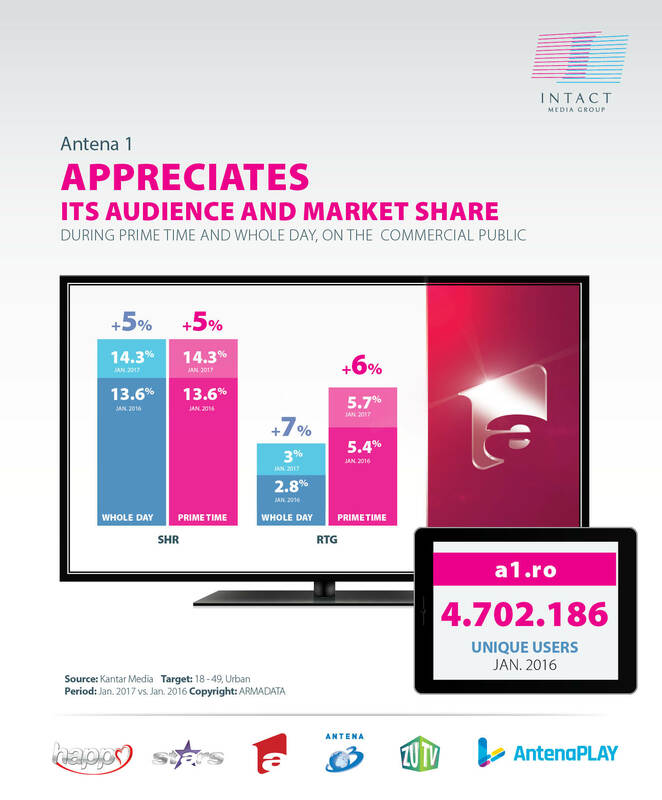 Antena 1, the flagship entertainment channel, home to the largest star system in Romania, has market share and audience evolution on most time intervals on the commercial target. Antena 1’s audience is on an ascending track on the majority of time slots, including Whole Day (+7%) and Prime Time (+6%) on the commercial target. The marked share also appreciated on most time slots, including Whole Day (+7%) and Prime Time (+5%). Poftiti pe la noi: poftiti la munca(reality show), Beat the blondes, followed by Observator (main news bulletin) and Acces direct (Access show) were amongst January’s most watched productions. Antena 1 was wtched in January, during Whole Day, for at least one minute, by 8.5 million Romanians, whilst www.A1.ro had more than 4.7 million unique users. 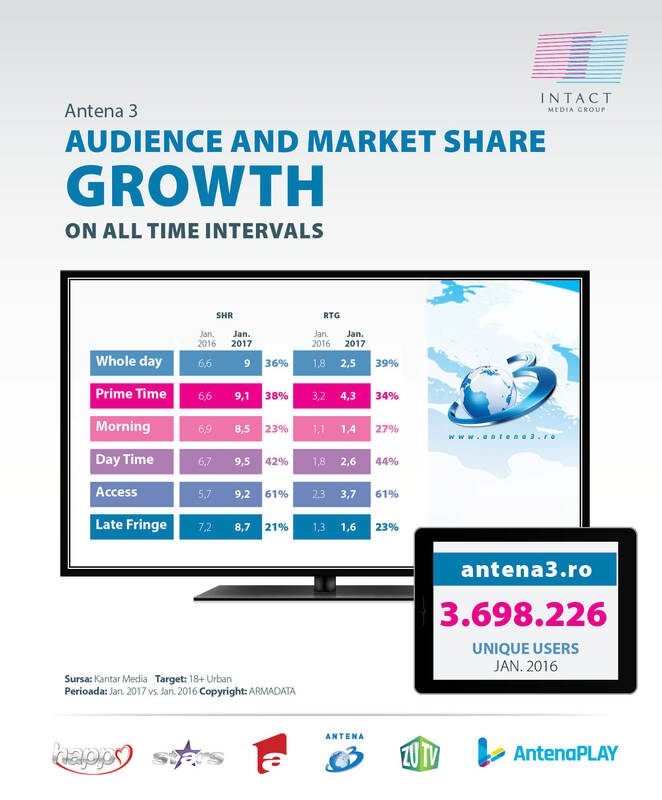 Antena 3 is leader of the news niche in Romania in January on important time slots, Scoring in the same time audience and market share appreciation, compared to January 2016. As such, audience appreciates by 34% during Whole Day while the market share rises by 38% during Prime Time and36% during Whole Day. On the 18+ target, specific to the news niche, Antena 3 was watched by more than 4.8 Romanians every day, on the National level. “Sinteza Zilei”,”Punctul de intalnire”, “Adevaruri ascunse”, “Exces de putere” and “Q&A” were the most watched productions in January. On the digital front, Antena3.ro had more than 3.6 million unique users in January. Antena Stars, the only TV channel dedicated to showbiz, was watched during January by more than 3.6 million Romanians, on the national target, during Whole Day, for at least one minuteAntena Stars’ most popular productions last month were “Agentia VIP”, “Răi da’ buni”, “Vedetop”, “Necenzurat”, “Refresh by Oana Turcu”. 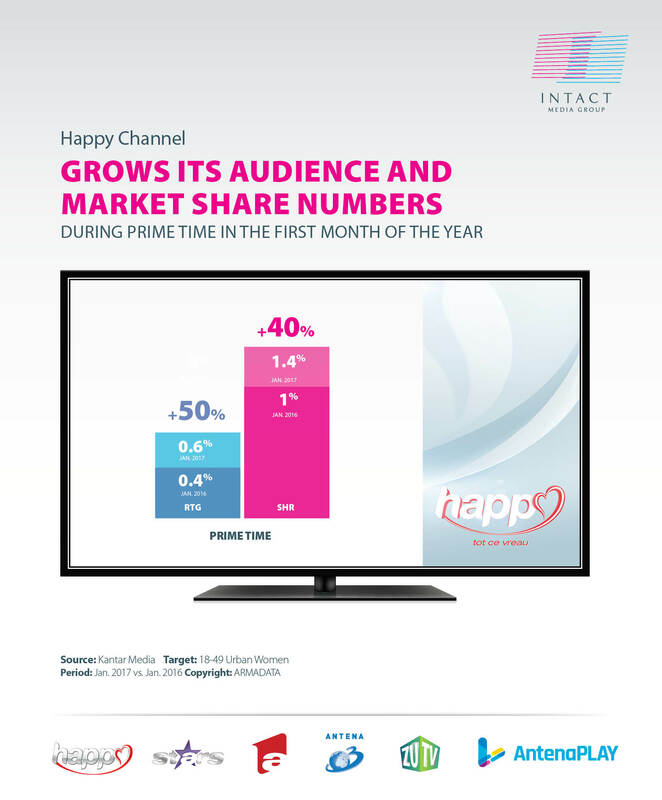 Happy Channel, the Group’s TV station addressed to daring women, had market share (+40%) and audience (+50%) appreciation during Prime Time compared to the first month of the previous year. ZU TV, the channel that addresses the young generation (15 – 34 years old, urban population) doubled its audience during Day Time and captivated its public with productions such as “Bobiceag și duba de artiști”, “Miezu’”, “Most wanted”, “ZU Party Romanian Tour” and “Zunrise”. In January 2017, Digital Antena Group had three of its websites in top 15 all sites in .ro – a1.ro, antena3.ro and spynews.ro. A1.ro is leader of the entertainment category, surpassing its main competitor and occupies the 8th position in all websites, whilst spynews.ro and antena3.ro had each more than 3.6 million unique users. In January 2017, more than 10 million Romanians watched Intact’s productions during Whole Day, for at least one minute, on national level and 7.6 million during Prime Time.